Once cooked, coat in olive oil. Slice onion into segments, as you would an apple. 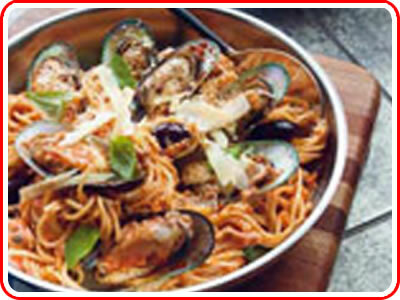 Fry onion with garlic and add the frozen KONO mussels in the shell, olives and pasta sauce. Simmer for five minutes. Add cream, fresh herbs, salmon and pasta. Gently fold through parmesan. Season well with cracked pepper and add salt to taste.